Do you ever have one of those days where you look at your bank account and go “Ahhhhhhhhh!”? Well fear not because this is one of the cheapest meals you can make for your family or even a crowd, and it’s absolutely delicious! Mexican is my favorite type of food to eat (and cook) and this will be a forever favorite whether I have $10 or $10,000 in my account! 1. Pour oil into a skillet about 1/3 of the way up the side. Heat on medium to high heat for about ten minutes before putting in 1-2 corn tortillas. You’ll want them to be beside each other, not overlapping. You’ll fry these anywhere from 8-15 minutes depending on the temperature of your oil. Flip them over several times using tongs to ensure equal cooking on both sides. You’ll know they’re done when they are golden and crisp like a chip. 2. Once tortillas are cooked take out and place onto a cookie sheet lined with paper towels. Season one side with Tony Chechare’s seasoning and place in the oven at 200F. This will keep them warm and crispy while you’re cooking other batches. 3. Once you’re done with your tortillas place refried beans in a microwave safe bowl and microwave on high for one minute with a handful of cheese. Feel free to also season with salt and pepper should you feel the need. 4. 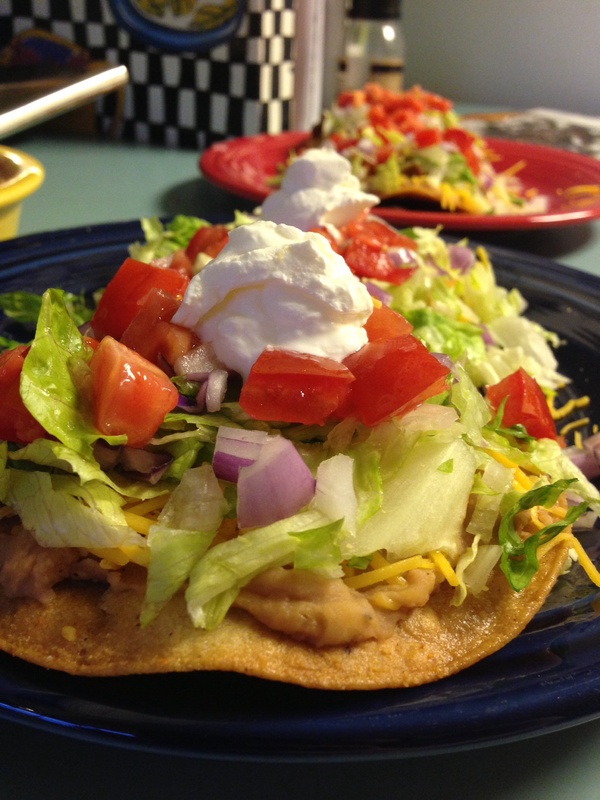 Using a knife spread heated cheesy refried beans in a thin layer on your chalupa (or tostada – I’ve heard it called both). Then top with another sprinkle of cheese, lettuce, tomato, onion, and sour cream if desired. You can add meat to these if you like on top of the bean mixture, but I like to keep mine cheap and simple! However, my husband topped his with leftover chili, and of course you could always add shredded chicken or taco meat as well for more traditional meat toppings.